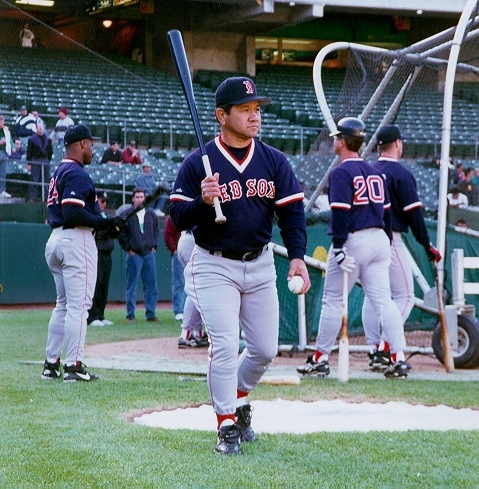 The Red Sox are on the road for a game against the Milwaukee Brewers at County Stadium. As the third base coach, I've given you some details as to what my typical daily routine is with respect to player preparation. However, there are other duties that must be performed prior to game time and they cannot be taken lightly. These are the administrative duties that the manager and coaching staff are responsible for. The following illustrations give you an inside look into the paperwork we must be aware of and how we can use it to win. This is the lineup and roster card for the game against Milwaukee. 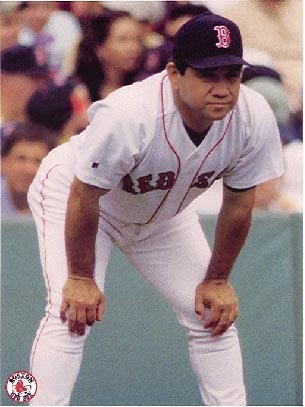 Before the game, the Red Sox side of the card is filled out with the starting lineup that manager Jimy Williams has selected. Below that, all the extra Red Sox position players and pitchers are listed. This gives us a snapshot view of who we have available at the beginning of the game. 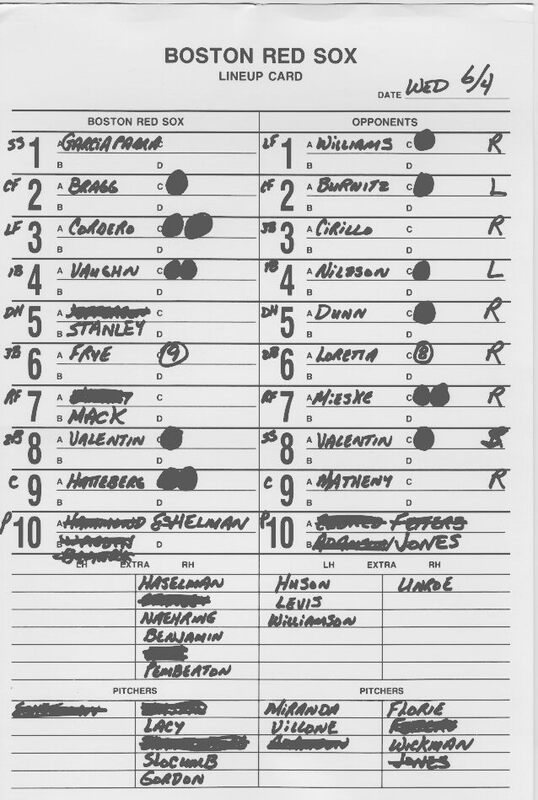 After the lineup cards (see below) are exchanged at home plate prior to the game, we then fill in the Milwaukee side of the listing. We now have the same view of the Brewers' roster situation as we do for the Sox. The lineup and roster listings are posted in the dugout and updated as each team makes lineup changes. If maintained properly, Jimy can take a quick look at the listing and know what matchups he may encounter at crucial points in the game. What right-handed hitters do the Brewers have available? What left-handed pitchers can the Sox use? How many position players do the Brewers have left? Do the Sox have the depth to make an infield defensive replacement? Each of these questions can be answered by using this listing. 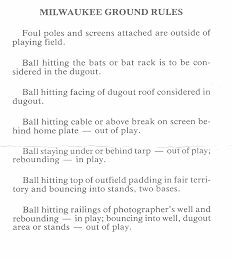 Here are the ground rules for Milwaukee County Stadium. In addition to exchanging lineup cards before the game, team representatives must meet with the umpires to discuss the ground rules. When the Red Sox are on the road, it is especially important for us to pay attention to the ground rules as they may have changed since our last visit to that town. It is also possible that temporary rules may be put in place due to weather conditions, stadium construction, etc. Whoever attends the home plate meeting is then responsible for relaying the ground rules to the players and coaches and making sure they understand them. 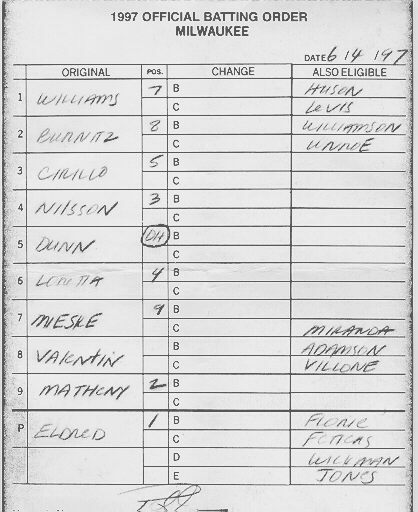 Here is the Milwaukee Brewers lineup card for our June 4th game as submitted by their manager, Phil Garner. 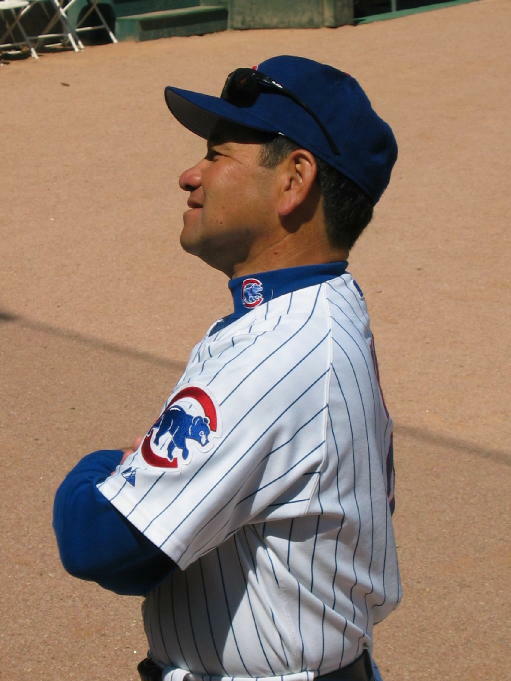 Phil must list his starting lineup in the exact order in which they will bat along with the position they will play. He must also list all other eligible position players and pitchers he has available. He must also sign the card. A copy of the card is exchanged at the home plate meeting prior to the game so the Sox will have a copy. As I stated before, we use this card to update our dugout lineup and roster listings. After the game starts, if the Brewers send up players to the plate in a different order than what is listed on the lineup card, it can cost them an out. It is part of our job as coaches to make sure the umpire catches the error and awards the out. If our lineup and roster listing is maintained correctly, this should not be a problem.